Lines drawn on a stone with an ocher crayon 73,000 years ago are the earliest symbolic art ever found, claim archaeologists excavating the famed Blombos Cave in South Africa, in a paper published in Nature on Wednesday. 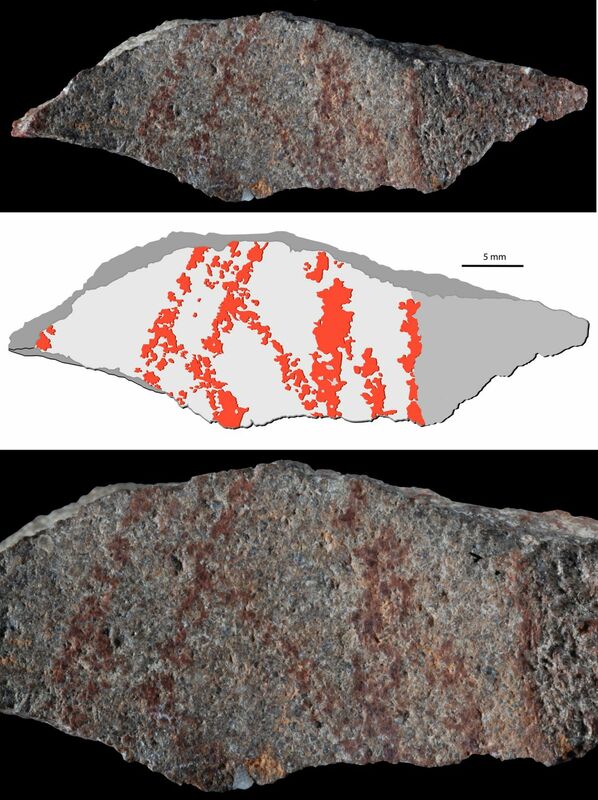 If it is art, the crisscrossing lines drawn in red ocher on a silcrete flake are tens of thousands of years earlier than any other known drawings, reports the international team of researchers. The archaeologists are confident that this latest “hashtag art” is exactly that: created deliberately, by early Homo sapiens. Moreover, the archaeologists believe the “hashtag” drawing – which is on a small 4 by 1 centimeter (1.6 by 0.4 inch) stone – broke off from a bigger picture, Prof. Francesco d’Errico of the French National Center for Scientific Research tells Haaretz. “It is a very small piece of rock, a tiny little fragment, which came from an object that had been bigger. Originally this pattern was certainly bigger,” he says. Can Caesarea Become the Acropolis of Israeli Tourism? D’Errico believes that in “its first life,” the original object may have been a grindstone; at some stage, it was cleaned off and then the drawing was made on it. And then the flake bearing the hashtag came off, or was knapped off, he explains. Whatever the original stone’s provenance, the team is confident in its interpretation of the drawing as art – as opposed to doodling. “It is a crosshatch of nine lines purposefully traced with a piece of ocher having a fine point and used as a pencil,” they write. 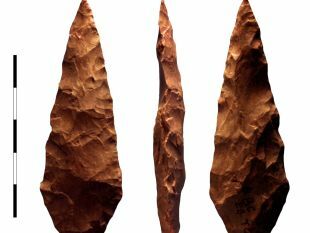 Also, it was found in the same archaeological layer with other prehistoric objets d’art, including carvings, bone tools and personal ornaments. Do not confuse this sapiens-made hashtag in Blombos with the Neanderthal hashtag from Gorham’s Cave in Gibraltar, reported in 2014. The differences are legion. One is that the human hashtag was carefully crayoned onto a small stone, not carved into the cave floor. Second, the Blombos creator was Homo sapiens. The Gorham hashtag is thought to have been carved onto the cave floor by Neanderthals, based on the fact that it was found beneath sediment in which Neanderthal-type artifacts were discovered. Third, the Blombos hashtag drawing is about 30,000 years older than the Gibraltar floor marks. 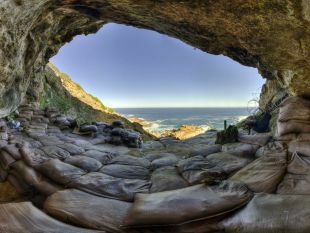 For all its fame in shedding light on early human behavior and diet, Blombos Cave is not very big. 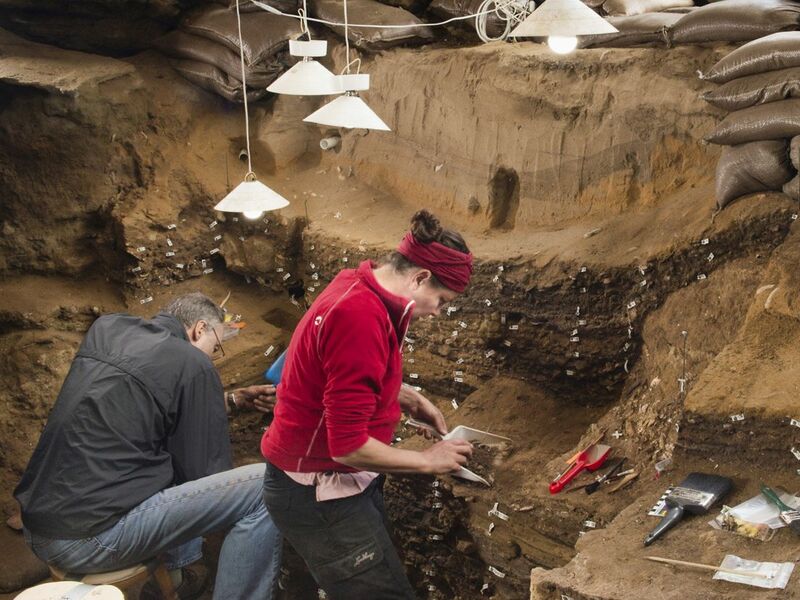 “It’s perhaps about 50 square meters in size,” says d’Errico, promptly noting, however, that when early humans lived in it, the cave would have been at least a little larger. Its entrance since collapsed, he says. Whence the confidence that the artists were early sapiens, as opposed to some branch on the Homo tree? D’Errico agrees that the proto-Picasso could have been some other hominin type. They certainly did abound in prehistoric Africa. But that isn’t the likely scenario. Also, modern humans remain the only hominin definitely known to have produced art. Reports earlier this year about Neanderthals being responsible for cave art going back 64,000 years in Spain and Portugal were based entirely on the observation that Neanderthals were known to live there back then, while Homo sapiens was only thought to have arrived some 20,000 years later. However, in the case of human evolution, absence of remains is proof of nothing. Hominin remains are incredibly rare: For instance, the whole species of Denisovan (a prehistoric hominin that lived in Eurasia) is only known from some teeth and one fingerbone found in a single cave in Siberia. Yet its stamping ground may have spanned much of the Eurasian continent. So we may reasonably assume that early human beings, modern humans, created the Blombos hashtag, and the date of 73,000 years throws back the history of symbolic drawn representation very, very far. Previously, the earliest examples of art, whether figurative or abstract, are around 40,000 years old and were found in Europe. Note that we speak here of drawing. Carvings and various engraved decorations go back a lot farther. The oldest known engraving is a zigzag that seems to have been purposefully carved into the shell of a freshwater mussel found in Trinil, Java, in 2014 – and that was made half a million years ago. Homo sapiens didn’t even exist yet: the artist was likely Homo erectus, archaeologists said at the time. Also, objects for personal adornment – including red ocher stones – have been unearthed at several archaeological sites in Africa dating back as much as 120,000 years ago. Blombos is located on South Africa’s Southern Cape coastline and has been undergoing archaeological exploration since 1991. The cave was apparently occupied for at least 100,000 years – a time defined as the Middle Stone Age. Its inhabitants were apparently happy to eat a vast variety of animals and fish as well. For one thing, archaeologists are seriously starting to think that early humans mastered symbolic thinking and the use of symbols a lot earlier than the 40,000-year age given to the earliest art until now. At Blombos itself, the archaeologists found carvings of abstract lines on ocher pieces within the same 73,000-year-old layer. These were strikingly similar to the drawing. Interestingly, while the drawing was made using ocher, the contemporary sort-of-hashtaggy carvings bearing abstract patterns were made of ocher itself. In other words, d’Errico explains, the Blombos people were producing similar patterns with different technology on different media. Slightly more recent discoveries around southern Africa indicate that by 64,000 years ago at the very least, people had developed a keen sense of abstraction. There are other pieces of engraved stone and ocher, albeit of uncertain dating: one pebble also found in South Africa, at Klasies River, has linear marks thought to be handmade. Klasies also produced a number of modified ocher bits. Another template for prehistoric art was the ostrich egg. D’Errico suggests that early modern people in South Africa used the eggs exactly as Bushmen do today: they would make a reasonably small hole, extract and eat the yolk and albumin, then use the shell to hold water. They may even have corked them somehow, but one other thing they did was decorate the shell – often with complex patterns. The same layer in Blombos has engraved bits of shell, some of which served for personal adornment. D’Errico himself has been involved in digs in northern Israel that produced jewelry, in the form of pierced shells from around 100,000 years ago – including the prehistoric site of Es-Skhul on Mount Carmel, and Qafzeh. 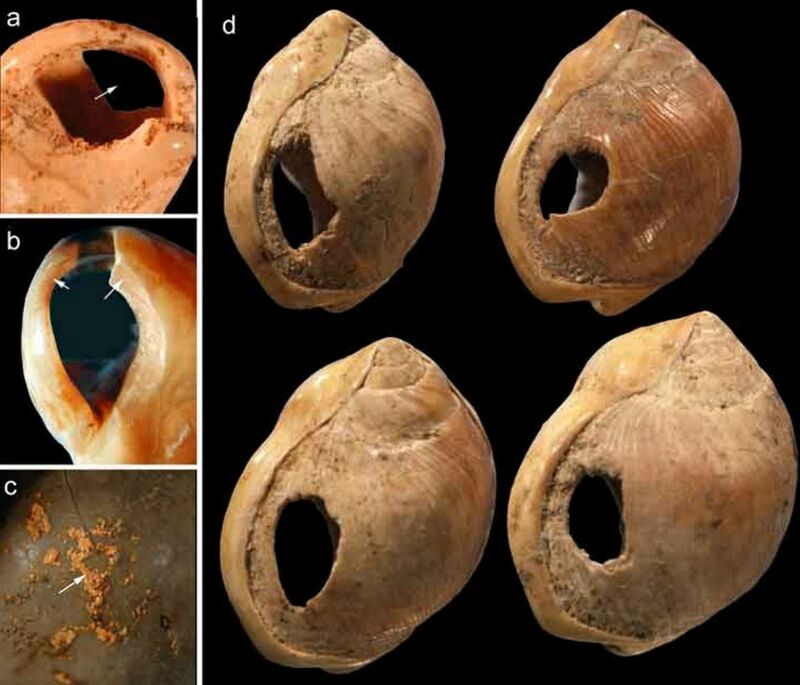 Those are not far from the sea, but pierced shells – presumably for personal adornment – were also found in Oued Djebbana, Algeria, almost 200 kilometers from the sea. The shells were collected, transported and worked, and then ascribed value. By the way, these were not snail shells for eating. The people at Blombos Cave ate “a very broad range of animals,” the team writes – they could evidently hunt large antelopes such as the eland, but did not cavil at eating the likes of turtles and even mole rats. “They also brought seal, dolphin and probably whale meat back to the cave,” the team writes. “The latter two were almost certainly scavenged from beach wash-ups, but seals may have been speared or clubbed.” Well, personal adornment may never have gone out of fashion, but at least clubbing seals is history.